Samantha McCurdy substitutes traditional canvas for thin, stretchable spandex, calling to mind the form-fitting attributes of yoga pants or a swimsuit. Hidden behind the painted stretched fabric, each work conceals spherical objects that bulge beyond the confines of the rectangular frame. Painted in vivid tones of orange and pink, or skin colored hues that more directly allude to the human form. 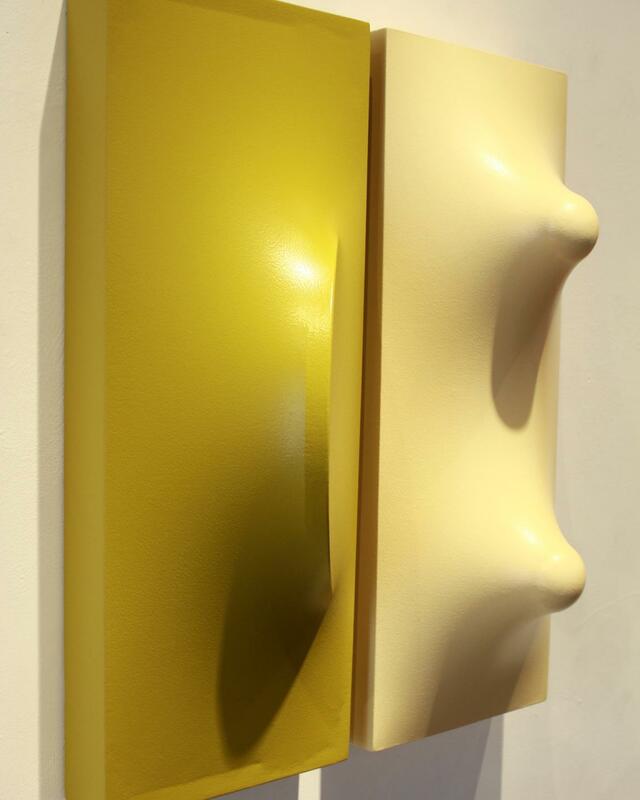 Tightly arranged, each work’s protrusions extend to its neighbor and seemingly reach for physical contact but ultimately never overstep that boundary. Each painting creates moments of tension through its invitation to imagine what lies hidden underneath the delicate surface and through its suggestive physical orientation, all the while maintaining its own unwavering agency. Samantha McCurdy (b. 1989) graduated from Maryland Institute College of Art, Baltimore. Lives in Los Angeles.